The best shower is the one you take after two nights of camping. I’m finally clean enough to touch my keyboard. Ellie and I camped out this weekend with friends in the Pike National Forest along Hwy 285. I went for my first high altitude mountain trail run in forever. This was somewhere between 6 and 8 miles along FR 120, keeping on the FR 121C branch that follows the North Fork of the South Platte River to its headwaters below Handcart and Gibson Peaks. The trail was essentially a rough 4×4 wheel drive road – really rough. There were numerous sections under water from a recent heavy rain causing me to bushwhack through the trees which was easy enough. The steepness wasn’t easy though; about 2000 feet of elevation gain in a little over 3 miles. I ran the first mile, maybe further, then mostly walked. The view of the Continental Divide grew more clear around each bend and pulled me up the road until it ended above treeline at the Missouri Mine – long abandoned and apparently radioactive if one is to believe the warning signs. I was able to trot back down slowly, the footing was too treacherous to wind it out on my return. The wind was cold and prompted me to finish up before getting caught in a downpour. I was able to toss some river water on my face and towel off, but had to rely upon hand wipes for my shower. This was the start of the weekend camp-out. Most of us went on a hike the next morning along the Colorado Trail from the Kenosha Pass Trailhead. This is a really pretty hike through heavy Aspen groves. The leaves were just starting to turn. I can only imagine the color two or three weeks from now. Scott invited the gang up to his home in Breckenridge in late September which is just over the Divide from this hike, so I’ll find out soon enough. We had perfect weather this weekend along with incredible eats. 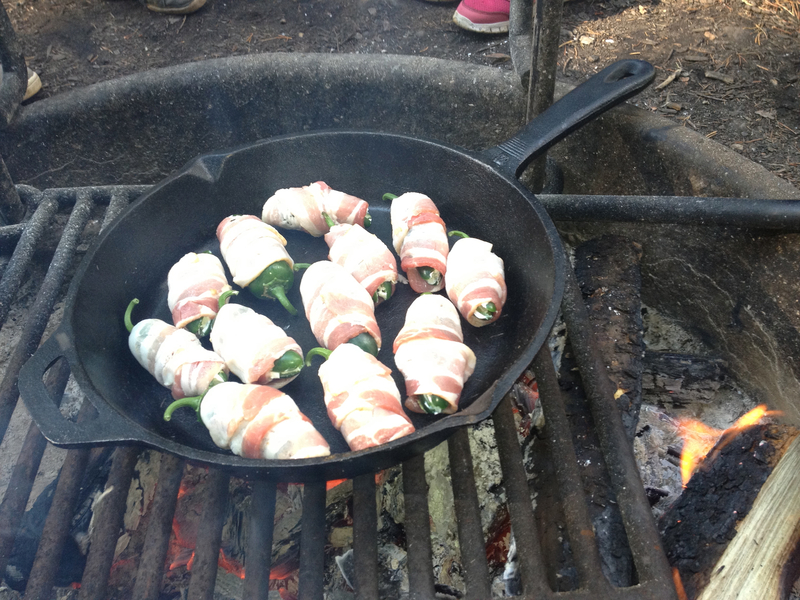 The bacon-wrapped Jalapeno Poppers – harvested from Scott’s garden – were my favorite. The Cincinnati Chili was as satisfying as it sounds. The kids played Warriors and Hunger Games in the woods along the river with a little Star Wars light saber dueling to complete their trilogy of adventure. Awesome weekend.